Boasting 52 rooms, a luxury pool and rooftop bar, it will set customers back up to £525-a-night. THERE is set to be a new hotspot in Ibiza following the expansion of Lionel Messi’s MiM brand. The Barcelona star has purchased Hotel Es Vives located on Figueretas beach. 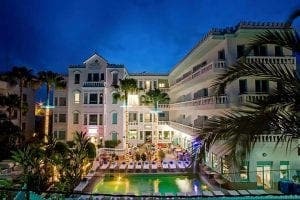 It follows on from last year’s purchase of four-star MiM Sitges which the 30-year-old bought for a reported £26million. Sources state that the hotel will be managed by Majestic Hotel Group and renamed to MiM Ibiza Es Vive. Next articleWhat shops on Spain’s Costa del Sol are open today and tomorrow?